This would've worked with Starlite from Rainbow Brite as well. I watched the He-Man & She-Ra movie and the Rainbow Brite movie so many times primarily because of their horses (I really really liked horses back then!). I could've done both versions but that would have been overdoing it. 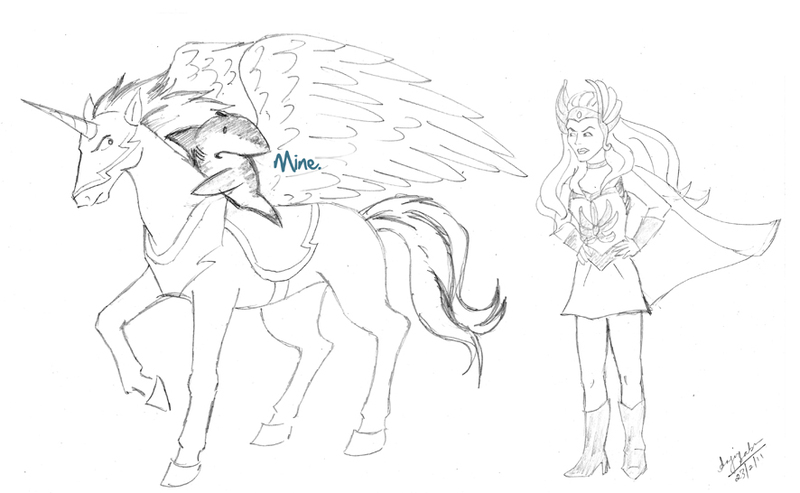 So I had to choose between the horses and I guess the flying unicorn won over the rainbow coloured hair horse (which would've required me to colour it in). 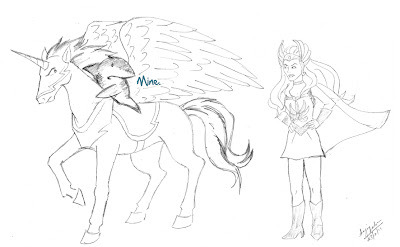 I must say that drawing She-Ra tired me out - I couldn't even draw her that well (He-Man was so much easier, with the abs and all). I would have left her out completely but then the sketch wouldn't have made sense.